Have you ever wished that you could email all of the people with registered accounts at your WordPress site? Or maybe just a laser targeted group of users? If you’re focused on building an email list, you’re probably using some type of email marketing service. But if you just want to send an email to your registered users, there’s no built-in way to do that with WordPress. In this post, I’ll get into how you can send emails to registered users through the WordPress email system (and a helpful plugin). It’s not always the best strategy, but there are absolutely times when you might want to use such functionality. When Might You Send Emails to WordPress Users? If you’re trying to build an email newsletter, you should absolutely use an external email marketing service. But there might be situations when you just need to send a blast directly to all or some of your registered users. A need to update their passwords. Or, if you’re running a site with guest contributors, you might want to email specific groups of authors with topics and guidelines. I’ll show you how to handle all of that – but first, I want to give you a couple best practices for sending WordPress email. Manage the server load required to send thousands of emails. Avoid your emails getting blacklisted. When you’re sending emails directly from WordPress, you lack these services. Instead, you’re using the wp_mail function by default, which is similar to PHP mail. What’s all that mean? You need to be careful about sending out emails directly from WordPress. If you have thousands of WordPress users, it’s a bad idea to send out 2,000 emails at the exact same time. Not only might this stress your server if you’re on a cheap plan, it can also get you blacklisted by some email spam services. For example, at my previous company (with much larger infrastructure than most WordPress sites), the Sys Admins still didn’t want us sending more than ~500 emails per hour. If you don’t want to go with an external email marketing service, another option is to use SMTP with WordPress. Using SMTP (Simple Mail Transfer Protocol) requires some configuration, but it will greatly increase the rate at which your emails are successfully delivered (i.e. avoid the spam folder). You’ll still have the potential problem of sending too many emails too quickly, though. With that caveat out of the way, let’s get into how you can send emails to all or some of your registered users. 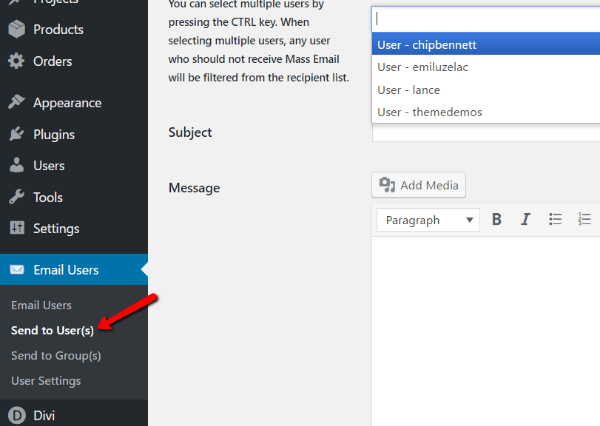 To both send to all users or send to specific groups, you can use the same plugin: Email Users. It’s 100% free and listed at the WordPress.org plugin directory. You’ll need to select all of the groups. Then, you can compose an email subject and message and send it off. Note – the plugin will use your WordPress account email as the “From” address. So if you don’t want your personal account email exposed, you may want to create a new account with a more generic email. 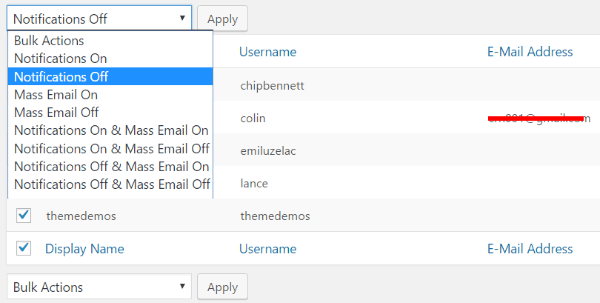 If you want to send emails to just specific groups, you can use the same interface as above. Just only select the specific groups you want to send an email to. You can select a single user or use CTRL + click to select multiple users. To compose and style your emails, the plugin gives you a TinyMCE box. That means the interface is identical to the WordPress Editor. You can add text styling, links, and images in just the same way. You’ll be able to upload images to your media library as well. BUT – I don’t recommend you fully compose your emails in this box. It’s a recipe for disaster because there’s no auto-save feature. That means one wrong click and you will lose all of your work. Don’t let it happen to you. If you use the Email Users plugin, always compose your emails in a separate window and then copy and paste them into the Email Users interface. Then, you just need to add any required images and you’re ready to send. Go into the User Settings interface (seen above) and turn off Mass Email for the user you want to exclude. 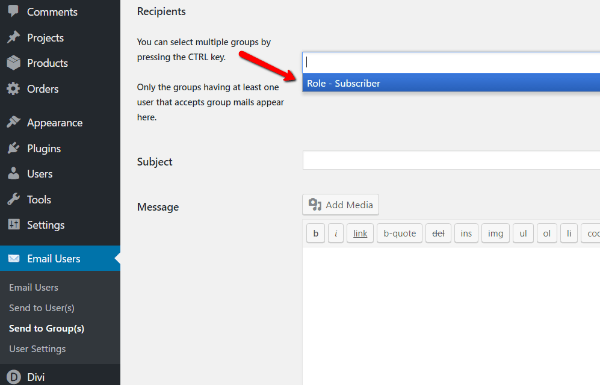 Then, send a group email to the Author user role like normal. Don’t use the WordPress email system as a crutch. If you’re serious about building a newsletter, you should absolutely use a dedicated service. But for sending out simple site announcements and updates, the WordPress email system is plenty functional. Just remember that if you have thousands, or even hundreds, of users, you may need to be careful about sending too many emails at once. And if you want to improve the deliverability rate for all the emails sent by WordPress, you might want to consider setting up SMTP. Do you use the WordPress email system to send out updates? Or do you prefer to use a dedicated email tool like MailChimp, etc? Thank you for sharing this article! All your articles are so informative I look forward to reading every email that I receive!! Do the same issues arise with sending notifications about a new blog post? ie – it comes from your server. Would there be a way to use wordpress.com to send new blog post notifications – does Jetpack do this? The easiest approach may be to get a Feedburner account (an old Google service), and send people to the RSS-to-email form. It’s free, easy, and just works. Thanks for sharing the information. The plugin seems to be great to us. I appreciate the intent of this article and while it’s informative and well-written, I think this topic is greatly misunderstood. People need to be aware of some inherent issues with sending email from within WordPress (or any website, really), especially if you’re using a plugin that sends using an account email address when the domain for the email address is not the same as the website domain. For example, my WordPress website domain is mywpdomain.com and my account email address is @somethingelse.com. In this scenario, there is a high likelihood that many of the messages I send won’t ever be delivered to the intended recipients. This is due to email authentication policies that have been rolling out for all the major email service providers over the last few years. Ultimately, this is a good thing because the intent, and the results, are making it harder for SPAM to be sent and delivered. Simply put, trying to use a server with mywpdomain.com to send email on behalf of @somethingelse.com will most likely end up getting your server flagged and could risk getting you booted from your hosting provider. Email authentication essentially works by checking for certain DNS records, such as SPF, and by utilizing DKIM, which stands for DomainKeys Identified Mail. DKIM is a method of authentication that is based on adding an encrypted signature to your emails. DKIM is one of the most effective ways to combat abuse and it can also greatly improve the deliverability of your emails. While those articles are from bulk email service providers and are directly applicable to best practices for using their services, the concepts are essentially the same here. When you have a website, and you have a need to send emails to users, and you want to be, and look, professional by having the email come from an address at the domain, you need to do it right. Transactional email services like Mandrill and SendGrid are great options. If you can’t do that, you should at least make sure that emails you send from WordPress utilize a from email address that shares the website domain to increase your deliverability rates. Developing a website for a client is one aspect of helping that person or business have an online presence. Email is another. If you’re going to utilize email as a tool in your belt to help customers, or even yourself, learn the right ways to do things. This is not meant to be disrespectful of Colin, or the commenters, but I’ve had to learn some of this the hard way over the last few years and I just want to encourage others to improve your knowledge and your skills.